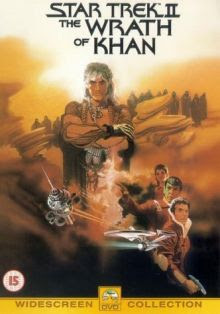 They were soaked with rain and huddled in blankets, but the 500 fans who had waited for hours yesterday to see the New York preview of the new "Star Trek" movie - "Star Trek II: The Wrath of Khan"- considered it part of the fun. "If people put up with the rain, the hours on lines and the pigeons all day long," said 31-year-old Robert Ildefonso, near the front of the line, "that's the trademark of the Trekkie." The film, which will formally open in New York on June 4, is the second one based on "Star Trek," the science-fiction series of the 1960's that has been in televised reruns for a number of years. Ralph Schiano, 28, said he had been waiting since early morning outside the Loews State I theater on Broadway at 45th Street. Wet to the skin and clutching a dark green blanket, Mr. Schiano nevertheless confessed to feeling pleased with himself. He was the first in line. By arriving at 1:30 A.M. yesterday for a show that was to begin at 8:30 P.M., he managed to beat the others to the theater. Behind him, the line stretched half a block up Broadway to 48th Street and then around the corner, almost to the Avenue of the Americas. According to the fans, Mr. Spock, one of the characters in the television series, will be killed off in the movie. One person had plastered the mailbox in front of the theater with a copy of "The Daily Tribune" headlined, "Spock Dies, Kirk is Heartbroken." The fans gave similar reasons for their devotion: addiction to the series, or in the case of younger followers, the reruns and a love of science-fiction.